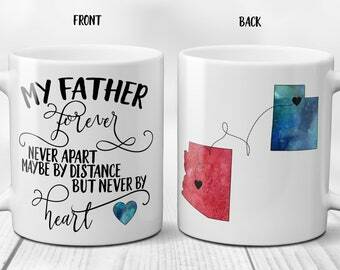 This listing is for one (1) mug. PLEASE READ THE ENTIRE LISTING DESCRIPTION. 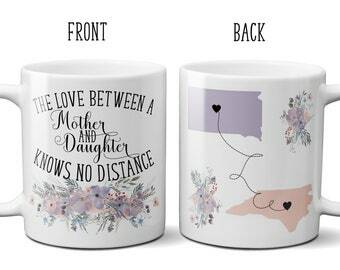 The mug can be personalized with any of the 50 US states and most countries. 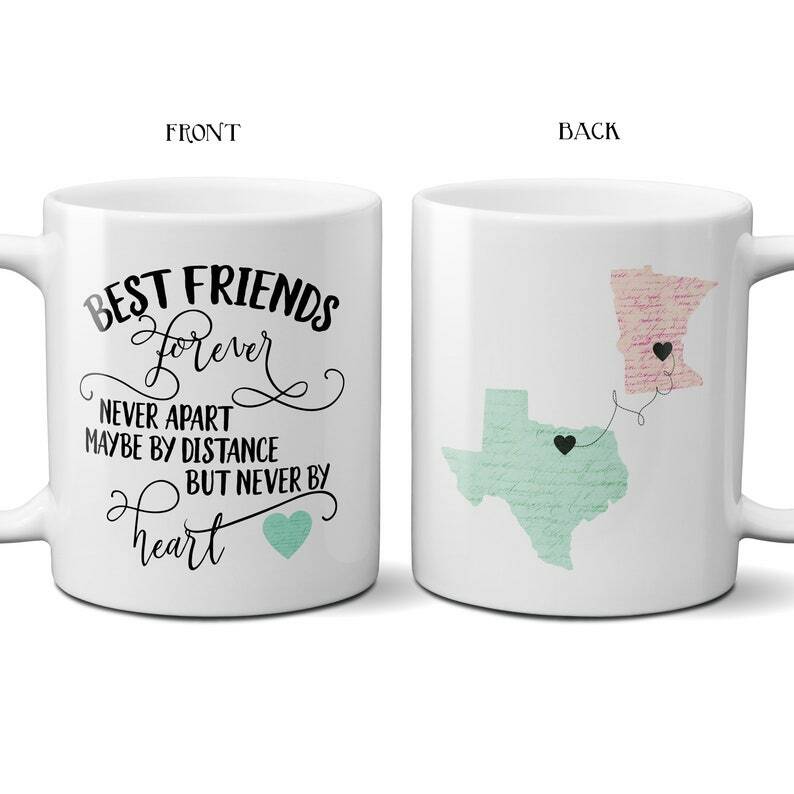 There is a heart in the center of each state (or country) ~OR~ over the APPROXIMATE location of the city you indicate in both states, then the hearts are connected by a dotted line. Side #2: Two states (or countries) with hearts over the APPROXIMATE location of the cities you indicate. A dotted line connects the hearts. 1. From the drop-down menu choose the size of your mug. 2. From the drop-down window choose if you want the hearts placed in the center of the state (CENTER HEART) or over the APPROXIMATE location of the cities you choose for each state (HEART OVER CITY). 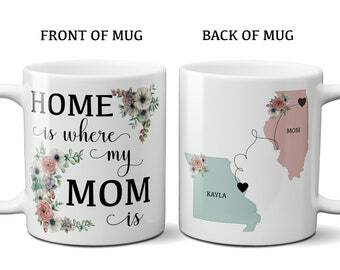 *** If you enter cities in this box but do not choose the city option from the drop down box, the cities will not be indicated on the mug. *** If you do not enter colors for your states, they will be made with the colors in the first listing photo (blush and mint). 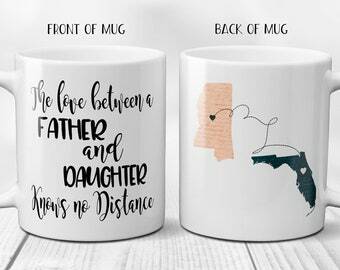 IF YOU CHOOSE CITIES: The city and state names you provide for this order are the primary search tools used to determine heart placement for this mug. You may provide an optional zip code which will be used ONLY if more than one result comes back in search for the city/state combination you provide. If no zip is provided, and multiple results come up in search, or no results come up in search, the heart will be placed in the center of the state. A zip code search will ONLY be performed if more than one option comes back in search for the city/state combination that you have chosen. If only one city/state option comes back in search, a zip code search will NOT be performed, therefore it is very important that you ENTER THE CITY AND STATE NAMES CORRECTLY spelling out the full name of the state and city. PLEASE DO NOT LEAVE ONLY A ZIP CODE. If you have any questions at all about how to order this item, please do not hesitate to contact me. Each mug is designed and embellished by hand, one at a time, here in my studio in Mississippi. 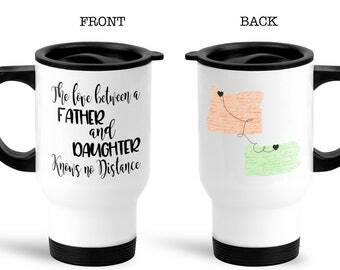 All mugs have a design on each side. We use premium ceramic mugs and high-quality ink to ensure a superior product. Our mugs meet or exceed FDA requirements for food and beverage safety. 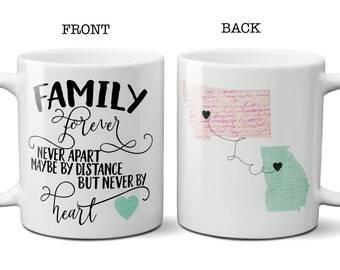 Family Forever Never Apart Maybe By Distance, Long Distance Mug, Family Mug, State to State Mug, Long Distance Family Gift, 11 or 15oz. 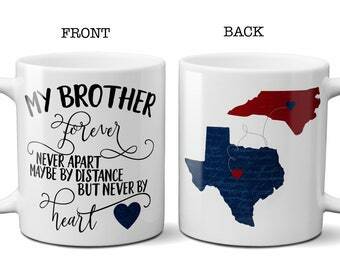 My Brother Forever Never Apart Maybe By Distance Long Distance Mug Brother Mug State to State Mug Long Distance Brother Gift 11 or 15oz. 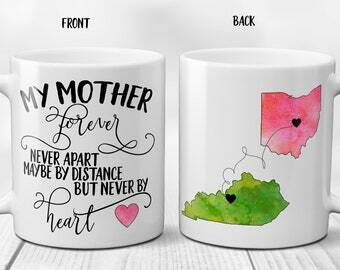 Sisters Forever Never Apart Maybe By Distance, Long Distance Mug, Sister Mug, State to State Mug, Long Distance Sister Gift, 11 or 15oz. Wow! This was such a great experience. Anna kept in contact with me about the exact details of my order and it arrived so quickly and in perfect condition. I appreciated that it was nicely packaged as this friend was moving and would be packing it anyway. I would absolutely use Anna again for any order! Loved it! Easy to order per instructions. Would order from shop again.